When you buy a ticket, make sure from which train station your train is leaving. Most convenience is to book your Beijing train ticket on the internet. Payment is in advance by creditcard. The Chinese travel agency deliver the train ticket at the reception of your hotel. They charge customers a small fee for this service. Hotels also make reservations for trains and airlines. If your journey is within 24 hours there is too little time to order a ticket on the internet. The cheapest tickets are sold at the railway station. The people at the ticket office speak little English. Therefore it’s good to write down your destination, time, class and train (if possible) on a piece of paper. The main stations have often an English speaking counter. 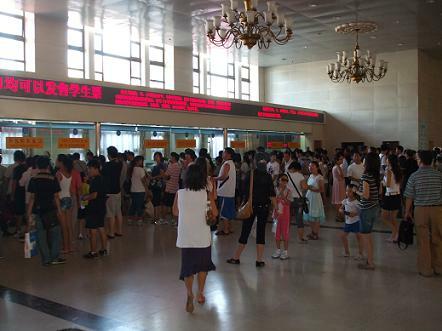 The Chinese buy their train tickets at www.12306.cn. Unfortunately the website is in Mandarin language and you need a Chinese bank card. 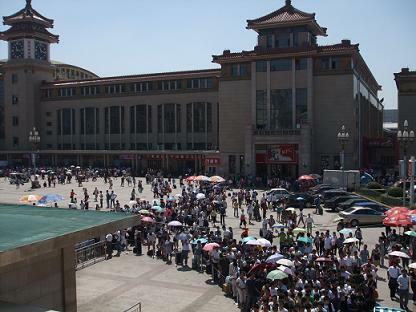 Central Station is in the heart of the city centre near Wangfujing and Tiananmen Square (2.5km). In the main building are the waiting rooms and platforms. The ticket windows are in a smaller building next to the main building. Destinations of Central Station are Harbin, Shenyang, Datong, Chengde, Nanjing, Shanghai, Hangzhou and international trains to Ulan Bator, Moscow, Hanoi and Pyongyang. 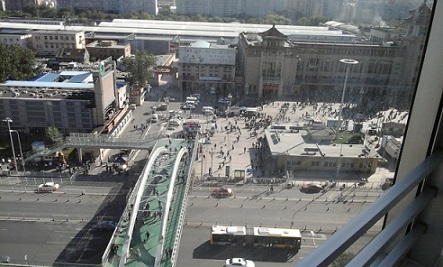 View at the station square of Beijing Central from Howard Johnson Paragon Hotel (2519 reviews, 8.0). The 4-star property is in front of the train station. A large footbridge crosses a busy thoroughfare. The main building is the one to the right. (picture Max Farrell) Beijing South Railway Station is the largest train station in Beijing. 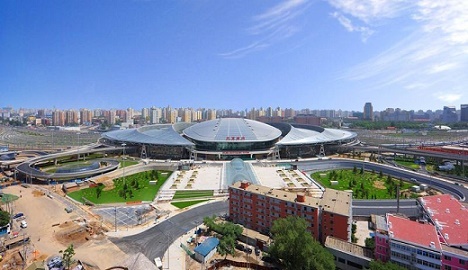 High-speed trains to Shanghai, Tianjin, Harbin, Nanjing, Qingdao, and Hangzhou depart from the South Railway Station. Subway line 4 is going to the South Railway Station. Distance to Tiananmen Square is 7km. A taxi from Tiananmen Square to South Railway Station is about 25 Yuan. Each day 8 high-speed trains leave Beijing to Xian. The journey takes 5-6 hours. The first high-speed train to Xian departs 7.00 and the last one at 17.00.